Moonflower: Madeira Applique, QAYG (possibly) 9 x 20 inch blocks background fabric approx. Strip pieced Hexagons: using Jelly Roll (JR) and background fabric. New Lone Star: all straight grain, no Y seams, self-patterned border top and bottom, using Jelly Roll (JR) and background fabric. 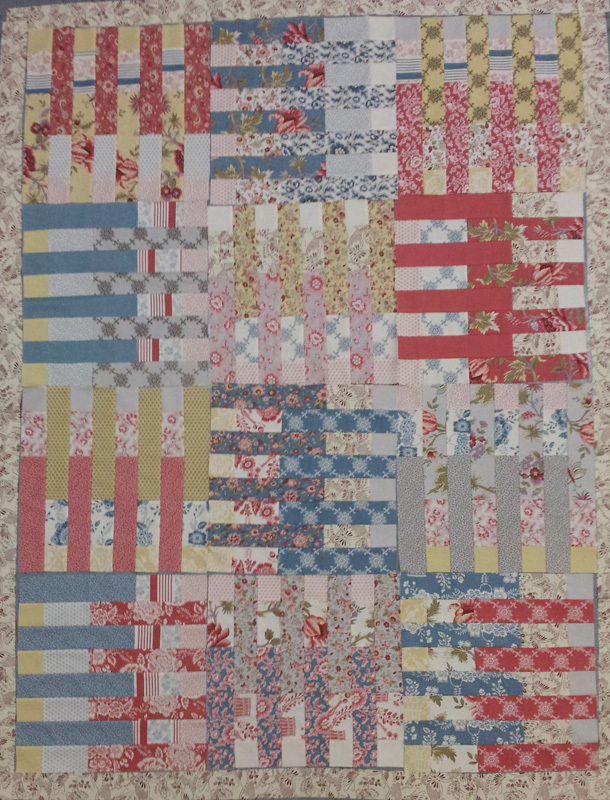 Scrap Quilt with a twist: using 2 inch wide pieces, Medium to Dark, Neutrals & Accent fabric scraps. Sit & Sew classes are $15 per day, Workshop days are $25 per day, Workshop follow up days are $15 per day and Hooped Machine Embroidery days are $15 per day. You can attend any combination of class types as per the table below totalling 8 full days for January 2019. If you cannot attend Weekday workshops and wish to do one or more workshops on the two Sundays instead, let me know. Workshop templates provided where needed and some pre-sewing of fabric strips (as will be indicated) is preferred for Strip Pieced Hexagons and New Lone Star Workshops. Limited number of small 60 degree triangle rulers are available to purchase for Hexagon quilt workshop. 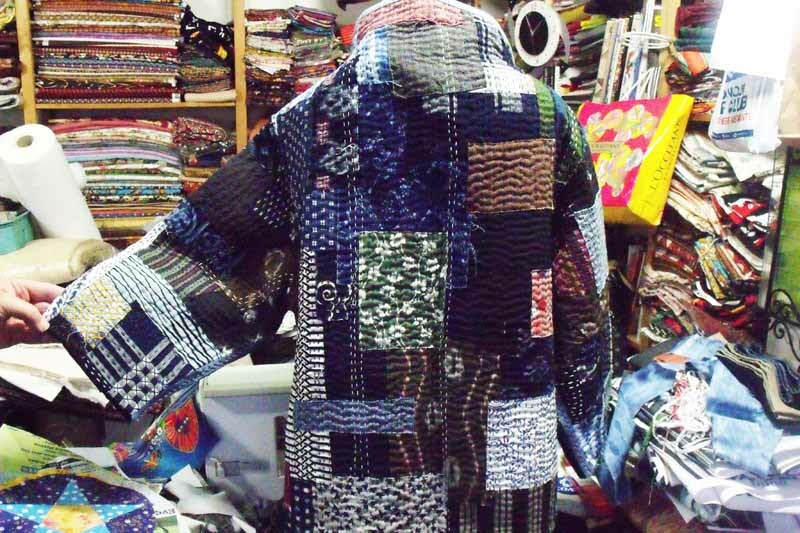 In this fun and exciting workshop, you will learn how to turn your inspiration into a colourful Boro Boro Jacket using an array of traditional Japanese skills. You’ll be amazed at the striking results achieved by using these innovative techniques following colour, composition and visual pathways as instructed by the tutor. 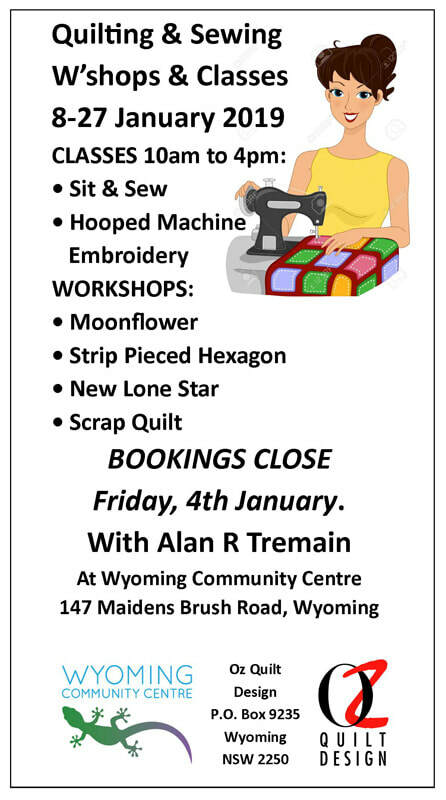 This workshop is for students of all sewing levels. Students must supply their own sewing machine. 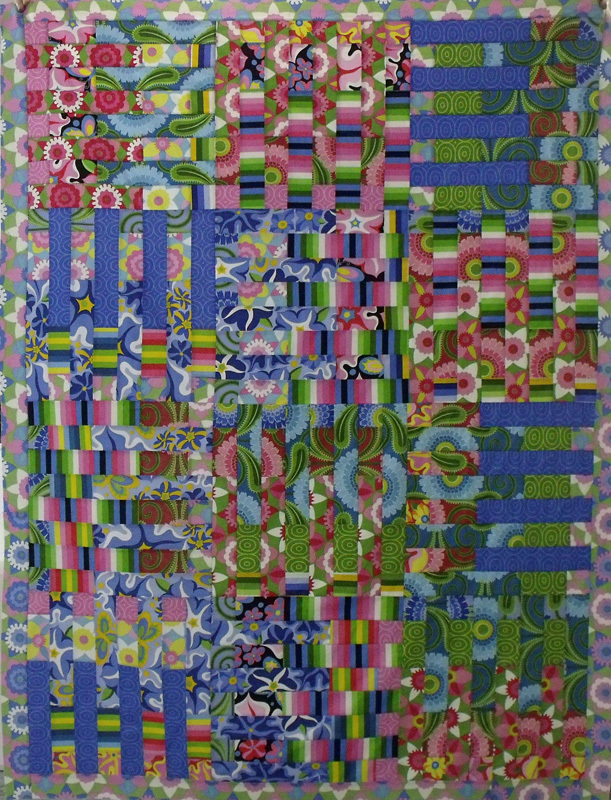 Katie Pasquini Masopust has granted Alan R Tremain permission to teach “Artful Log Cabin Quilts” as featured in her latest publication of the same name. Images from this workshop may also be included in Alan’s forthcoming book. sense of fun and adventure and the will to make a delightful quilt top!!! 22 Fat Quarters from your stash. Use up all those ‘Why did I buy this fabric’ fat quarters. Each fat quarter should be a different print. Cutting ruler at least 6 inches wide, rotary cutter with cutting mat 10 inches square or larger, neutral coloured machine sewing thread, sewing machine with ¼ inch quilting seam foot and usual sewing kit. Tea, coffee & gluten free cake provided. BYO mug and lunch. Bookings: 0418 273 940 or email via Contact page. A sense of fun and adventure and the will to make a delightful quilt top!!! Fabric A – 21, 5½ inch x 42 inch (minimum) WOF strips. Colours for Fabric A – Co-ordinated within a fabric range (i.e. by designer) or a colour range (i.e. blue, red purple) or pattern print,(i.e. Batik) Each Fabric A strip to be different. Fabric B – 21, 5½inch x 42 inch (minimum) WOF strips. Colour for Fabric B – All the same print, small to medium all over print either lighter or darker than Fabric A selection. My textile discipline has been dramatically shaped by machine sewing, having learnt at 4 years of age. My next major ‘event’ was 1966, what a wonderful time to be thirteen! 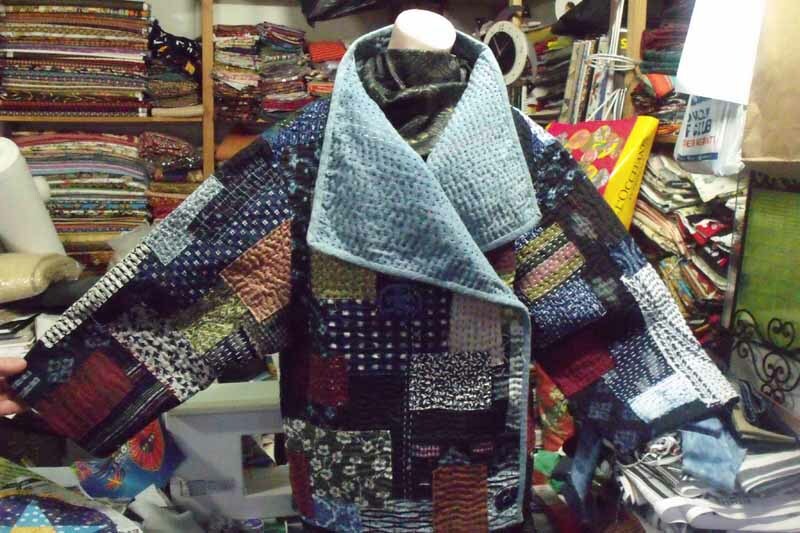 After years of creating costumes, fashion and fantasy wear, miles of hand-woven cloth and square metres of hand-woven tapestry, I feel my current work in quilt making is still in transition. As I embrace more definition I sway between commission commands and the self-imposed personal style art quilts. My emotional response to colour and the textural qualities of machine stitch still prove to be the starting point for each work which then moves onto the inviting shapes of nature and the realms of mystery and magic. My works are never repetitive but do have some recurring thematic symbols either by colour, design or inspiration. From an early stage my work has been influenced by artists that use fabrics from our everyday existence like Mary Fogg and Ina Georgeta Statescu and in more recent times wonderful Australian artists like Judy Hooworth, Alison Muir and Carolyn Sullivan for both their character and textile design skills. My development of my ‘Emotional Response to Colour’ theory and how this can be implemented to solve any personal colour problem or barrier as applied to colour selection for quilt making, has proved very successful with thousands of students benefitting after participating in workshops. Emotional Response to Colour development is achieved by discussion, practical presentation and demonstration, personal and group realization and utilization of practical reinforcement leading to achievement. I have now developed a series of workshops, each a little more intricate and demanding to lead students further along this path of self-exploration. Shadow Trellis is for all skill levels and creates wonderful colour combinations. Jane Sassaman and Le Bouquet Francais fabrics were used in the two quilts shown but you can create your own masterpiece using any colour combination. Dates: Monday and Tuesday 4 & 5 April 2016 from 10:00am to 4:00pm. Where: Art Studios Co-operative, 391 Mann Street, North Gosford NSW 2250. Street parking is available in nearby Dwyer Street. This 2 day workshop produces a quilt top measuring 52 ½”x 68 ½” (133cm x 172cm) using an unusual light/dark shadow block, making a striking blended pattern. Block size is 16” square with 12 blocks to be made. Only three basic shapes are cut and the blocks assemble quickly leaving ample time for design/layout opportunities. Prior ‘Emotional Response to Colour’ students can apply this theory to their colour selection. 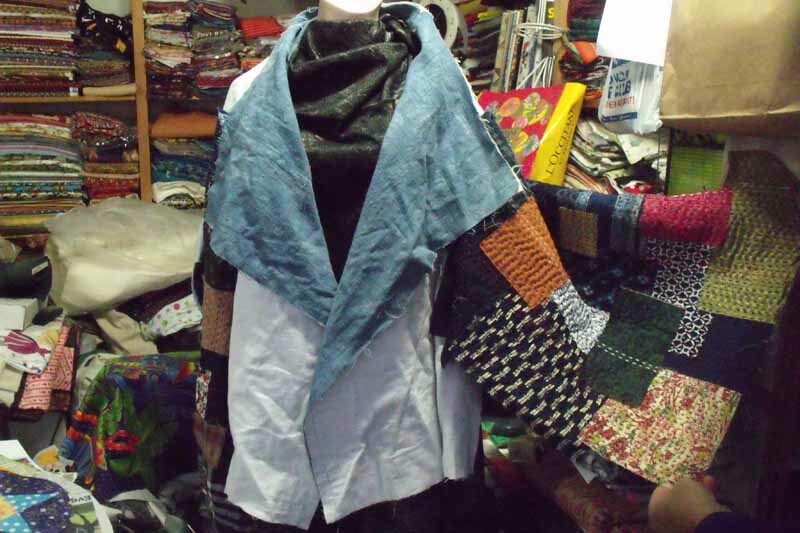 Colour composition by personal assessment is a key design element in this class and comes after all students have constructed their 12 progress blocks using light, medium & dark fabrics.